i was kinda hoping that the dog would be the one ratnerized. NEW YORK -- Brett Ratner's Rat Entertainment has optioned the feature film rights to the novel "The Reluctant Communist" by Charles Robert Jenkins with Ratner eyeing director duties on the project. Ross Katz, writer and director for HBO's "Taking Chance," is adapting the memoir into a screenplay, and John Cheng, head of feature development for Rat, will executive produce. There is currently no studio attached to the project. "The Reluctant Communist" tells the true story of Robert Jenkins, a U.S. soldier who deserted his post in South Korea and surrendered to communist North Korea in 1965. Instead of getting him back to the U.S., the move left him held in North Korea for close to 40 years. He became a reluctant celebrity as the North Korean government used him as the "American villain" in its propaganda films. "The story is heartbreakingly sad, yet funny and romantic all at the same time," said Cheng. "It has so many of the elements you look for in a great film." Rat Entertainment is currently also developing a feature film version of "Hong Kong Phooey" with Alcon Entertainment, a remake of "The Last American Virgin" with Millennium Films and "True Crimes" with Universal Focus Features. The company said Ratner is in pre-production with a November start date on "Tower Heist" for Universal and Imagine Entertainment, starring Ben Stiller. Casey Affleck is in negotiations to join the bold-faced named of Universal and Imagine's "Tower Heist." Matthew Broderick and Judd Hirsch are also joining the movie. The action comedy, being directed by Brett Ratner, sees Ben Stiller leading a cast that includes Eddie Murphy, Alan Alda, Tea Leoni, Gabourey Sidibe and Michael Pena. "Heist" is about an overworked manager (Stiller) of an illustrious tower residence who leads a team of defrauded workers in a heist of its penthouse tenant, a Bernie Madoff-type Wall Street capitalist (Alda) who pulled a Ponzi scheme and swindled the staff. Affleck will play Stiller's friend who also works under him in the penthouse but is a straight arrow and wants to turn Stiller and the other co-conspirators in. Broderick will play a Wall Street-type who is actually one of the good guys; he lost his job and joins Stiller's gang. Broderick's last feature was a starring turn in indie drama "Wonderful World". His last studio movie was Universal's screen adaptation of "The Producers." He is repped by CAA. For Affleck, repped by WME and Brillstein Entertainment Partners, the movie represents his first move since starring in "The Killer Inside Me" and since the unveiling of his much-ballyhooed pseudo-documentary "I'm Still Here." Looking forward to seeing 'The Ratner' poster for you-know-what. Or is it against the rules to put his face on anything PTA related? I don't know if I could. It just feels so... wrong. yeah, disregard that thought. Just a dumb late-night idea. I don't think it'd even be funny as much as it would make me sick to my stomach, like every other time I see that jerks face. Me being relatively ¨new¨ here... I gotta ask. Why do you guys hate Ratner so much? Lol. I mean, I dont like his movies either. But whats the story behind the Hate? Fill me in. "We hold some truths to be self-evident." 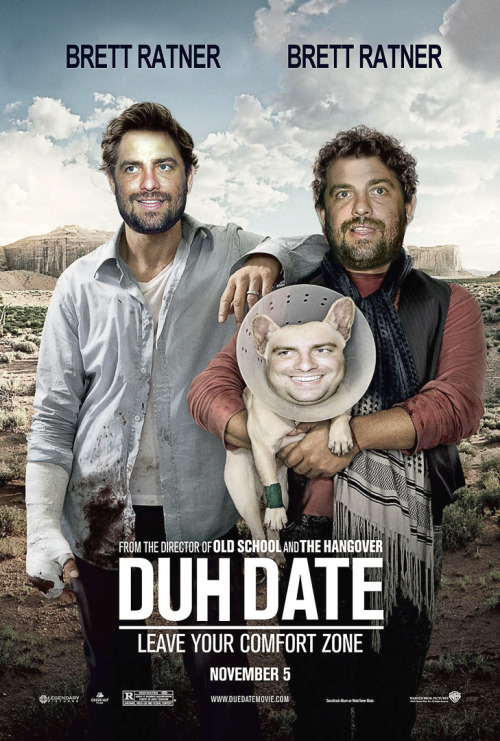 The thing with Brett Ratner is that none of us should even know his name. He's a middle-of-the-road paycheck director who makes middle-of-the-road Walmart movies, like hundreds of directors who have come and gone without anyone really knowing who they were, yet because his talent for self-promotion so outpaces his talent for filmmaking, he's one of the handful of directors that your average person has heard of. That said, I can't even bring myself to hate the guy. Yeah, he's basically a slow child who makes bad movies and doesn't know how to act in public without embarrassing himself, but he seems harmless. Following him on Twitter is like following a kid who's excited that his grandma just sent him 100 bucks for his bar mitzvah present. Did he suffer a brain injury? He already knows about these posters and tweeted about them three years ago when we/polk originally made them.